Chef Tom Moskos, a celebrated chef, self-published cookbook author and culinary business founder, will lead all dining outlets and private events at the Wisconsin lakeside resort. [Chef Moskos] has catered to celebrities such as President George Bush Senior, Al Gore, James A. Lovell and Hulk Hogan. He was also featured on an episode of WOW Network’s Platinum Weddings. 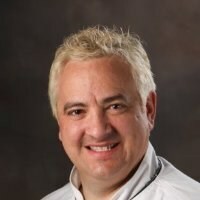 Heidel House Resort & Spa is pleased to announce the appointment of Tom Moskos to the position of executive chef. Moskos, a celebrated chef, self-published cookbook author and culinary business founder, will now lead all dining outlets and private events at the Wisconsin lakeshore resort. Moskos comes to Heidel House Resort having worked in culinary for more than 25 years. He attended Triton College in River Grove, Ill., and completed a three-year culinary apprenticeship with Westin Hotels & Resorts, where he graduated with the highest score to date. He then worked his way up the culinary hierarchy, holding several positions with Starwood Hotels & Resorts throughout the Chicago area. He has worked as an executive chef for his last 10 years in the business, most recently at Chicago’s Westin Lombard Yorktown Center. During his career Moskos has had several opportunities to showcase his passion and expertise. He has catered to celebrities such as President George Bush Senior, Al Gore, James A. Lovell and Hulk Hogan. He was also featured on an episode of WOW Network’s Platinum Weddings in 2010. In May 2013, Moskos published his own cookbook. “The Art of Good Eating” is a collection of recipes, stories, tips and tricks written for any home cook who is preparing to entertain family and friends. It marked the launch of his cooking demonstration business of the same name, which aspires to educate and empower others so they may confidently cook in the comfort of their own homes. Heidel House Resort includes four restaurants as well as banquet facilities. The bistro-style Sunroom, BoatHouse Pub and fine dining Grey Rock boast incredible views of Green Lake, each with their own distinct menu. The Spa Café offers lunch with a floor-to-ceiling view of Tuscumbia Country Club for Evensong Spa guests. In addition to the 18,000 square feet of indoor meeting space, private events with catering are held in the outdoor Carriage Tent and 60-foot Escapade yacht. For more information, visit http://www.heidelhouse.com or call 800-444-2812.